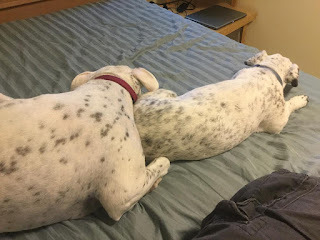 Deaf Dogs and Benevolent Gnomes: Big News! We have a big announcement to share. After 8 years in North Dakota, we're pulling up stakes and headed West to Boise, Idaho. Alycia has accepted a position with a university in Boise and is pretty excited at this new opportunity. We're planning on moving out there shortly and hoping to get settled in before her semester starts at the end of Summer. It will be a bummer to leave North Dakota. It was enjoyable to be close to Alycia's parents and see them on a regular basis. We have made some great friends in our short years here, and found people who gladly accept my *ahem* eccentricities. It will be rough to leave the garden I've spent 8 years toiling in, but the sting of leaving is replaced by knowing the our new household is in Zone 6, so many new plant opportunities abound. For the first time in 8 years I didn't plant a garden this Spring, or start seeds in the basement, or take multiple trips to area nurseries. That felt very strange. This big news is why we've been quiet here on the blog front for the month of May. Coordinating the end of two jobs, buying a house, and preparing to sell a house have taken up most of our time. Not to mention the myriad of other little things that go along with moving a thousand miles away. It's also been critical to give the dogs extra attention and love during this time of change. They know something is up and we want to give them reassurances that they're part of the moving plan. In the meantime, we're in the midst of the actual physical moving process. The house is a mess and strangers of all sorts have been coming and going over the last month, the dogs are exhausted from having to vet and re-vet so many new people. And since most of the dog beds and people chairs have been packed, everybody gets to snuggle together on the spare bed. This seems to be a fairly acceptable consolation prize for the pups. More to come. Thanks Karen! I've made all my gardening friends here jealous by telling them all the wonderful things I can now plant that they can't. Rainier cherries, peaches! !